One common application of CAPTCHA is for verifying online polls. In fact, a former Slashdot poll serves as an example of what can go wrong if pollsters don't implement filters on their surveys. In 1999, Slashdot published a poll that asked visitors to choose the graduate school that had the best program in computer science. Students from two universities -- Carnegie Mellon and MIT -- created automated programs called bots to vote repeatedly for their respective schools. While those two schools received thousands of votes, the other schools only had a few hundred each. If it's possible to create a program that can vote in a poll, how can we trust online poll results at all? A CAPTCHA form can help prevent programmers from taking advantage of the polling system. Registration forms on Web sites often use CAPTCHAs. For example, free Web-based e-mail services like Hotmail, Yahoo! Mail or Gmail allow people to create an e-mail account free of charge. Usually, users must provide some personal information when creating an account, but the services typically don't verify this information. They use CAPTCHAs to try to prevent spammers from using bots to generate hundreds of spam mail accounts. Ticket brokers like TicketMaster also use CAPTCHA applications. These applications help prevent ticket scalpers from bombarding the service with massive ticket purchases for big events. Without some sort of filter, it's possible for a scalper to use a bot to place hundreds or thousands of ticket orders in a matter of seconds. Legitimate customers become victims as events sell out minutes after tickets become available. Scalpers then try to sell the tickets above face value. While CAPTCHA applications don't prevent scalping, they do make it more difficult to scalp tickets on a large scale. Some Web pages have message boards or contact forms that allow visitors to either post messages to the site or send them directly to the Web administrators. To prevent an avalanche of spam, many of these sites have a CAPTCHA program to filter out the noise. A CAPTCHA won't stop someone who is determined to post a rude message or harass an administrator, but it will help prevent bots from posting messages automatically. The most common form of CAPTCHA requires visitors to type in a word or series of letters and numbers that the application has distorted in some way. Some CAPTCHA creators came up with a way to increase the value of such an application: digitizing books. An application called reCAPTCHA harnesses users responses in CAPTCHA fields to verify the contents of a scanned piece of paper. Because computers aren't always able to identify words from a digital scan, humans have to verify what a printed page says. Then it's possible for search engines to search and index the contents of a scanned document. Here's how it works: First, the administrator of the reCAPTCHA program digitally scans a book. 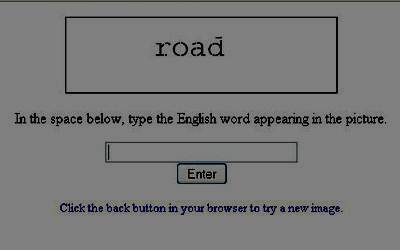 Then, the reCAPTCHA program selects two words from the digitized image. The application already recognizes one of the words. If the visitor types that word into a field correctly, the application assumes the second word the user types is also correct. That second word goes into a pool of words that the application will present to other users. As each user types in a word, the application compares the word to the original answer. Eventually, the application receives enough responses to verify the word with a high degree of certainty. That word can then go into the verified pool. It sounds time consuming, but remember that in this case the CAPTCHA is pulling double duty. Not only is it verifying the contents of a digitized book, it's also verifying that the people filling out the form are actually people. In turn, those people are gaining access to a service they want to use. Next, we'll take a look at the process that goes into creating a CAPTCHA. Installing a CAPTCHA on your Web site is as easy as copying a few lines of code into your site's HTML page. And it won't even cost you a dime -- many CAPTCHA applications are free. The challenge in breaking a CAPTCHA isn't figuring out what a message says -- after all, humans should have at least an 80 percent success rate. The really hard task is teaching acomputer how to process information in a way similar to how humans think. In many cases, people who break CAPTCHAs concentrate not on making computers smarter, but reducing the complexity of the problem posed by the CAPTCHA. 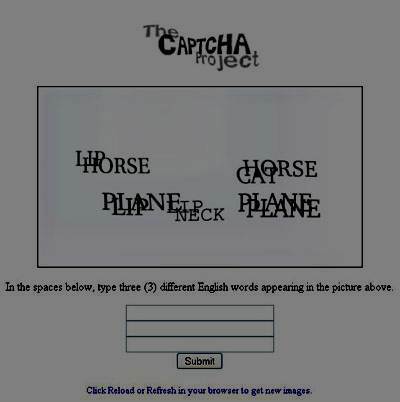 Hackers have found ways to teach computers how to recognize the text in EZ-Gimpy CAPTCHAs. Luis von Ahn of Carnegie Mellon University is one of the inventors of CAPTCHA. In a 2006 lecture, von Ahn talked about the relationship between things like CAPTCHA and the field of artificial intelligence (AI). Because CAPTCHA is a barrier between spammers or hackers and their goal, these people have dedicated time and energy toward breaking CAPTCHAs. Their successes mean that machines are getting more sophisticated. Every time someone figures out how to teach a machine to defeat a CAPTCHA, we move one step closer to artificial intelligence. As people find new ways to get around CAPTCHA, computer scientists like von Ahn develop CAPTCHAs that address other challenges in the field of AI. A step backward for CAPTCHA is still a step forward for AI -- every defeat is also a victory [source: Human Computation]. But what about Web administrators? They might not find von Ahn's philosophy to be nearly as attractive. From their perspective, they still have to deal with a massive problem -- spammers and hackers. People who maintain Web sites or create online polls need to be aware that several CAPTCHA systems are no longer effective. It's important to do a little research on which CAPTCHA applications are still reliable. And it's equally important to keep up to date on the subject. If one CAPTCHA system fails, the administrator might need to remove the code from his or her site and replace it with another version. As for CAPTCHA designers, they have to walk a fine line. As computers become more sophisticated, the testing method must also evolve. But if the test evolves to the point where humans can no longer solve a CAPTCHA with a decent success rate, the system as a whole fails. The answer may not involve warping or distorting text -- it might require users to solve a mathematical equation or answer questions about a short story. And as these tests get more complicated, there's a risk of losing user interest. How many people will still want to post a reply to a message board if they must first solve a quadratic equation? Eventually, we might reach a point where computers and humans perceive puzzles the same way. If that happens, tests like CAPTCHA will become useless lines of code. Until then, we'll just have to squint (or listen) carefully while trying to decipher CAPTCHA codes. To learn more about Web site security and related topics, test out the links on the next page. The ESP Game, which pairs players up, shows each player a picture, and challenges the players to come up with the same tags to describe that picture. Each verified tag helps categorize the photo for search engines. Then there's Verbosity. One player describes a word to another player using a series of clues. The other player must guess the correct word. The Matchin game presents the same two photos to two different players. Each player picks the photo that he or she likes the most. Both players earn points for every match. As the game gathers results, it categorizes photos from most attractive to least attractive. How CAPTCHA Works | How English are you?